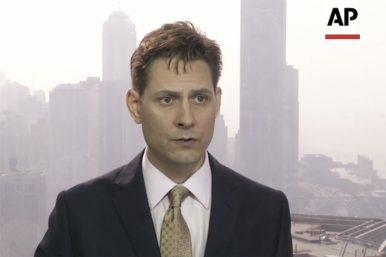 In this image made from a video taken on March 28, 2018, Michael Kovrig, an adviser with the International Crisis Group, a Brussels-based non-governmental organization, speaks during an interview in Hong Kong. Questions related to the incident dominated the Chinese Foreign Ministry’s Wednesday press briefing. The row between China and Canada over the case of Meng Wanzhou — chief financial officer and deputy chair of Chinese telecoms giant Huawei as well as a daughter of Huawei’s founder, Ren Zhengfei — is getting increasingly complicated and severe. On December 11, Reuters broke the news that China has detained Michael Kovrig, a former Canadian diplomat who currently works for the International Crisis Group (ICG) as Senior Adviser for Northeast Asia. The incident happened soon after Meng was arrested in Vancouver, British Columbia on December 1 at the request of U.S. law enforcement authorities. On December 12, ICG released a formal statement on its website, calling for Kovrig’s “immediate release” and revealing more important details on the case. ICG said in its statement that Kovrig was “detained on Monday [December 10] night in Beijing by the Beijing Bureau of Chinese State Security” and the organization has received no information since then. “We are making every effort to learn more and to secure consular access to Michael from the Chinese authorities,” the statement added, implying that Kovrig has not been granted consular access yet. According to Kovrig’s resume, since joining ICG in February last year, he has been focusing on foreign affairs and global security issues in Northeast Asia, particularly on China, Japan, and the Korean Peninsula. With a master’s degree in international affairs from Columbia University, Kovrig previously worked as a Canadian diplomat in Beijing, Hong Kong, and at the United Nations in New York. ICG further said that among its prominent trustees coming from the highest levels of government, business and philanthropic institutions worldwide, two trustees are Chinese: Hu Shuli, founder and publisher of Caixin Media, and Wang Jisi, president of the Institute of International and Strategic Studies at Peking University — an apparent attempt to demonstrate ICG’s credibility and impartiality. The wording and tone ICG adopted in its statement hinted that the organization feared the same. The timing of Kovrig’s detention made many people believe that the incident is exactly one of the “grave consequences” Le referred to. As Chiu pointed out in her article, in 2014, Canadian Christian aid workers Julia and Kevin Garratt were arrested by Chinese officials and accused of spying. “Many believed it was retaliation for the arrest in Canada that same year of Chinese citizen Su Bin, who was accused of hacking U.S. military databases, ” Chiu wrote. Unsurprisingly, questions related to the incident dominated the Chinese Foreign Ministry’s regular press briefing on December 12. Foreign Ministry spokesman Lu Kang refused to confirm Kovrig’s detention. Instead, he repeatedly stressed that ICG was not registered in China, and thus its activities in the country were illegal. “Once its staff are engaged in activities in China, it has already violated the law,” Lu said, referring to the Chinese foreign NGO law issued in 2016.